Do you have a question you've always wanted to ask Joan? Now’s your chance! 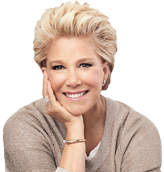 Get answers to your questions from Joan Lunden and leading industry experts in health, caregiving, family and more! Q: I’m looking for a fun & healthy dinner recipe for my kids, any recommendations? Q: Do you have any good book recommendations for Boomers? Q: You keep telling us to “know our numbers,” but what are our numbers? Visit the botom of the site for helpful links or tweet @JoanLunden day or night with your questions and comments. We will do our best to find the answers from our experts. We look forward to hearing from you! I am here to answer your questions about health, fitness, nutirtion, family, home, boomers and caregiving. Don’t know how to ask your question? Don’t worry, we have included some smaple questions below to help inspire you. Q: I’m having a hard time getting my mom to talk about what our plan will be when she can’t live alone anymore. What can I do to help her be open to the conversation? Q: How can I keep my brain from getting old? Q: I’m having a holiday party and I need decoration ideas, can you help? Q: Can you recommend easy exercises for a busy mom to get back into shape? Q: I have tried everything and I still can’t sleep at night, what can I do?